pated increases in salary levels, changes in benefits and burdens, overruns in service and expense budgets, premium costs for overtime, or the assignment of higher priced personnel than planned. This example shows an estimated rate of $20 with tracking curves starting at $23-$26, dropping to $17-$18,and finishingat the estimated level. It reflects high-salaried personnel at the start of the project (department managers, project management, process engineers) followed by a lower-priced drafting operation with higher-salaried engineers returning at the end for punchlist work and plant start-up/commissioning. 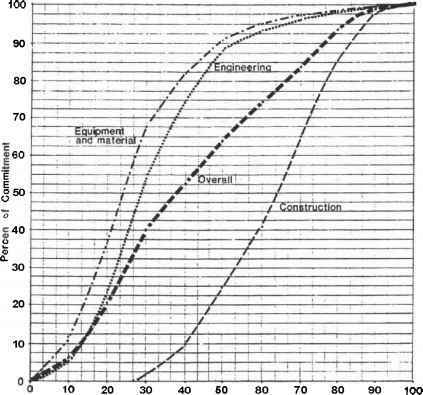 The planned curve can be developed from historical experience and/or by evaluating rate curves for each major section, category, or engineering discipline and then adding them together on a weighted manhour basis. Figure 7-10 shows cumulative planned and actual profiles of direct labor manhour rate. This rate represents total labor costs divided by total direct manhours. The monthly status can be tabulated as shown. Significant deviation of actual versus planned values can indicate a potential overrun. Rate overruns can occur because of different craft mixes, union contract changes, governmental regulation changes, and premium costs for overtime and shift work. In this example, the planned and actual curves track reasonably closely for the first six months. Abrupt changes in a cumulative profile do not generally occur when the job is well advanced as there is too much weight of past performance to allow instant or abrupt change. A turndown can indicate release of higher paid crafts, escalation lower than anticipated, or failure by trade unions to achieve pay demands. • Then a slight turndown due to lower paid insulators and painters. Project Management for Engineering and Construction Figure 7-9. Overall Home Office Man-Hour Rate Curve. Figure 7-10. Construction Labor Curve. Figure 7-11 illustrates a typical commitment curve for bulk materials and equipment. This curve tracks actual cumulative material commitments relative to a planned profile. This curve will only indicate a trend of total commitment. A significant trend at this stage is an underrun or overrun of actual commitments versus individual control estimate budgets. a) As a graphical, overall forecasting tool b) As a rough check on the procurement progress, assuming the planned curve reflects the current schedule. Significant deviations of actual versus planned values can provide a trend for cost deviation. It may be required that separate curves be drawn for equipment, bulk materials, and supply and erect subcontracts for the project control of large projects. The major purpose of trend curves is to track actual performance/experience against a planned or anticipated base. The effectiveness of this technique depends on the quality of the "measuring base," or plan. Any resulting trend deviation can then be analyzed and the "result" can then be forecasted or trended. Curves provide a much better analytical tool than does a tabulation or report of numbers. 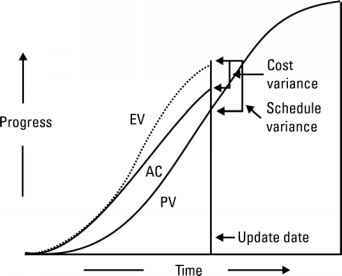 The following are typical examples of monetary and manhour expenditure curves. Figure 7-12 shows planned and actual expenditure curves of home office costs. Planned curves are developed by judgment and historical experience and can be compiled from profiles of more detailed elements. It is possible on large projects that individual curves might be used to track non-manhour related expenses, such as computer, reproduction, communication and travel-relocation costs. Figure 7-11. Material Commitment Curves. Figure 7-12. Home Office Cost Expenditure Curve. 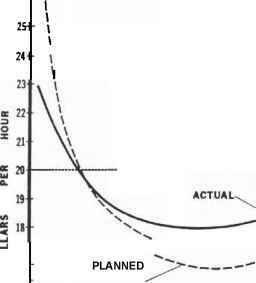 This example shows the actual expenditure curve consistently underrunning the planned until the end of 1976 where it continues straight on instead of commencing to run down. A trend was discernible in mid-1976, and, in fact, a forecasted overrun had been made in the third quarter of 1975. A further overrun was made in the first quarter of 1977 due to failure of the curve to commence a rundown. Figure 7-13 shows typical examples of manhour tracking curves. It should be emphasized that this technique does not really control effort or measure performance, but indicates a trend and plots a possible outcome. This example shows an overrun in process design (completed), shows an overrun in the civil plan as of the reporting period, and is on target with piping design, but with a different profile. The overall cumulative report is an overrun. Projecting forward at a rundown profile similar to the plan will give a forecasted overrun at completion. Historical experience can assist in developing good expenditure curves. However, evaluation will depend on the skill and experience of the cost engineer. In practice, especially on large, complex projects, manhour overruns might be due to recycling of engineering, caused by design error or owner changes. As indirect labor budgets are often poorly estimated, tracking curves should be considered for major indirect categories. Figure 7-14 shows a typical indirect manhour tracking curve. Manhours and manhour costs could be tracked separately. A separate curve for average hourly rate could be drawn, or alternatively, the hourly rate can be entered on the manhour chart as per this exhibit. The monthly status is tabulated as shown, and forecasts are shown. Forecasted manhours multiplied by the anticipated hourly rate will give forecasted costs. Figure 7-13. Engineer Manhour Expenditure Curves.